Windy or cold weather: when does heating demand peak? Do Irish buildings need the most heat when it's coldest, or when it's milder but windy? What consequences are there for how we build and heat them? And how airtight are Irish buildings anyway? We naturally assume that our homes and offices need the most heat when it's coldest outside. But what if it isn't that simple? Energy consultant Paul Overy has seen buildings in recent years where wind, rather than the temperature outside, dominates the need for heating ― particularly non-domestic buildings like factories and offices, for which there is no airtightness demand in Irish building regulations. Overy first noticed this in 1998, when carrying out dynamic energy simulations on a new 5,000 square metre school. "The peak heating demand occurred when it was 7⁰C outside and a gale was blowing, rather than when it was below freezing," he says. He noticed something similar when his company, Overy & Associates, moved into new offices two years later. The building was very well insulated, but there was little attention to airtightness. "We installed a carefully designed radiator heating system to normal design criteria, yet the offices are cold on particularly windy days when outdoor temperatures are well above freezing." It's impossible to make sweeping statements about whether wind or temperature drive heating demand more – a complex mix of factors including insulation, airtightness and the local climate all play a role. But there are reasons to think wind could drive heating demand in Irish buildings more than in other countries. For one, the airtightness levels of our existing building stock appear to be mediocre at best. The backstop required under building regulations – 7m3/hr/m2 for new homes – leaves a lot to be desired, with no standard for non-domestic buildings. 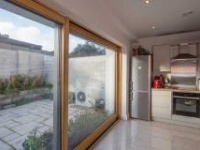 Unlike insulation no grants are available in Ireland to fund airtightness upgrades – barring some rudimentary draught proofing work under the Warmer Homes scheme. Arguably it's been much more common for recently built buildings to be leaky than poorly insulated. Putting in extra insulation is relatively easy – especially if you’re not paying attention to cold bridging – but it takes real attention to detail to make a building airtight. "If new and renovated buildings are well insulated but not airtight, perhaps it’s important to look at how wind speed varies with outdoor temperature," Overy says. To shed some light on the topic, he performed a few calculations. First he took hourly weather data for Birr, Co Offaly, over 12 typical months of the year, and plotted wind speed against temperature. The results show that wind speed tends to be slower when it's freezing outside, while fast winds are associated with milder temperatures. This is important, as it means these two conditions ―high wind speeds, and cold temperatures ― can be treated somewhat separately. Next, he used the EnergyPlus software from Lawrence Berkley Labs to simulate how much heat a leaky non-domestic building uses, and when. He found most of the demand for heat is actually when it’s quite mild outside. "If the building is dominated by wind-driven infiltration, then its main heating energy use is more likely to occur in milder weather rather than on the coldest days," he says ― essentially the leakier a building is, the more heat it will need when it's windy. He offers a simple calculation to demonstrate this. First, he took a theoretical 1,000 square metre, two-storey office building (with a floor area of 500 sq m, wall area of 432 sq m, and window area of 108 sq m). The walls, roof, windows and ground floor all meet the elemental U-values listed in the 2007 edition of Part L of the building regulations, which deals with energy efficiency. The building has a very poor airtightness of 20 m3/hr/m2 at 50 Pascals pressure. In still conditions its infiltration rate is close to zero, because there's little wind-driven heat loss. But in strong winds infiltration could shoot up to over one air change per hour, with an associated heat loss of over 2,000 W/K. By comparison, its fabric heat loss is less than 600 W/K. The building will need significantly more heat when it is windy and mild than on cold, still days. Making the building more airtight will save far more energy than beefing up its insulation. For his next exercise, Overy analysed the tutorial building in iSBEM, the software used to generate Building Energy Ratings for non-domestic buildings. He ran the building with the same U-values and air permeability (20 m3/hr/m2) as above, but then improved its air permeability to 5 m3/hr/m2 at 50 Pa. This cut the building's use of heating fuel by 46%. But airtightness and insulation aren't strictly separate, so deciphering how much of a building's heat loss is down to one or the other is tricky. Insulation can perform much worse than expected if it’s affected by air movement. Even in a sealed cavity, this can occur if there are temperature differences that cause air to move. The effect is worse if cold external air gets into the insulated cavity, creating an open loop where one air mass replaces another. "When air movement is sufficient, due to the wind or stack effect, an open loop can result in the complete elimination of the effectiveness of thermal insulation," architect Mark Siddall wrote in a paper on thermal bypass, published in Green Building magazine in 2009. "Wind washing can affect the thermal performance of low density insulation, short circuit the performance of insulation sheathing, and cool down an air barrier system located towards the outside of the wall assembly." As far back as 1978, research found that a windtight wall subjected to an air speed of 2.5 metres per second parallel to the insulation suffered a 10% drop in thermal performance. But subject the walls to gaps and cracks so it’s no longer windtight, and the performance of the insulation drops 40%. Airtightness means preventing air penetrating through the building shell, while windtightness means stopping outdoor air getting to the shell. In an ideal construction, the airtight layer is usually found towards the room side of the wall build-up, with the windtight layer towards the outside. In a 1996 paper looking at the importance of windtightness to timber frame construction, Sivert Uvslokk of the Norwegian Building Research Institute studied what happened when the barrier was subjected to leaks. He concluded that this type of "forced convection" can cause heat loss "three to ten times higher" than that calculated for windtight constructions. Seven years before that, the Fraunhofer Structural Physics Institute in Germany studied the effect of poor wind and airtightness on a wall build-up that included 140mm of mineral wool insulation and an internal vapour barrier. The temperature inside was set to 20C, and -10C outside, with a pressure (20 pascals) equivalent to force three or four winds. First, they studied the performance of the insulation when installed with an airtight, seamless vapour barrier. It performed as expected, with a U-value of 0.30 W/m2C. But then they created a tear ―one metre long and one millimetre wide ―in the vapour barrier. 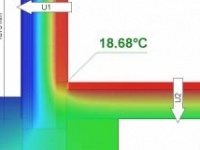 The U-value of the insulation shot up to 1.44 W/m2K. Then they made the same tear 3mm wide, and the U-value grew to an abysmal 3.3 W/m2K. What does this mean in an Irish context? While our climate isn't as cold as the one modeled by Fraunhofer, their research still shows the potential for air infiltration to drastically damage the effectiveness of thermal insulation. The Fraunhofer Institute also investigated the effect such leaks have on the building structure, simulating temperatures of 20C inside and 0C outside. While the intact barrier let a small, safe amount of moisture through (0.5g/m2), with just a 1mm gap the amount of moisture getting through increased by an astonishing 1,600 times. 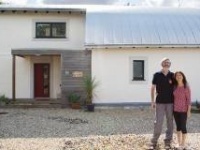 Writing on the US-based homeenergypros.lbl.gov internet forums, Passive House Institute director Dr Wolfgang Feist said that energy saving was not the main motivation behind the exacting airtightness requirements passive houses must hit. The target of 0.6 air changes per hour at 50 pascals of pressure is to avoid structural damage caused by condensation. "That's the most frequent cause of structural damage in winter cold climates – and certainly also in summer humid climates," he wrote. "We can avoid such damage by using airtight constructions." With our milder winters, Ireland doesn't suffer the same risk of condensation that's associated with freezing temperatures. But we still have to protect our buildings from the damp. And as we've seen from the non-domestic building examples above, there's reason to suspect wind could have more effect on the thermal performance of Irish buildings than in central Europe. This raises a question: if the heating demand in many Irish buildings is peaking when it’s windy, as opposed to when it’s cold, should this change how we heat them? What heating devices work most efficiently in windy, mild conditions? But his mind could be changed for leaky buildings, which often need more heat when it’s windy rather than cold ―a typical Irish condition for much of the year. And he pointed out that on windy days, electricity has a lower carbon intensity because wind turbines are contributing more to the grid, helping to lower the carbon emissions associated with heat pumps. Of course it makes more sense to make leaky buildings airtight first, he says. "We had a mannequin equipped with all sorts of sensors for measuring thermal comfort,” he says. “When you have it in the room you'll find all sorts of influences. If air is moving it can have a significant influence. Drafts can transmit cold, and cause you to feel it quickly." Colclough said the work, led by Dr Philip Griffiths, found that “There's a significant difference in the thermal comfort in the room if there's a draft," meaning that occupants may need to put up the thermostat by a degree or two to feel comfortable. Ultimately, it's important that we really try to understand the interactions between airtightness, insulation, temperature and wind speed rather than just making assumptions. "The marketplace as a whole doesn't understand these things," he says, "and jumps to conclusions that may be incorrect, and some research wouldn't go amiss." How airtight are Irish buildings anyway? Currently, we don’t have an accurate picture of the airtightness of the Irish building stock because, quite simply, a suitably large and representative sample of buildings hasn’t been tested. What data we do have is hugely skewed. At the time of writing, the Sustainable Energy Authority of Ireland’s National BER Research tool lists 4,815 airtightness tests on dwellings in the Republic of Ireland. Of those, just over half (2,435) are for homes that were built after the end of the construction boom, and are subject to the 2007 update to Part L of the Building Regulations. These homes were legally required to have airtightness tests done – and to achieve 40% energy savings compared to previous regulations. Their average primary energy demand (for heating and cooling, hot water and lighting) was 87.5 kWh – a mid range B1 BER. But the database also includes a further 4,189 homes which were subject to the same regulations, yet failed to have airtightness tests done. The difference? Their average energy demand came in at 135.8 kWh/m2/yr (B3) – an astonishing 48 kWh higher than the houses that had airtightness tests. This doesn’t mean that getting airtightness tests done will boost your energy rating. The 37% of projects which were tested fared so much better because they were generally compliant, and because much better attention was paid to energy efficiency generally than in the untested houses. This means that they’re not even a representative sample of the historically low volume of newly built homes, let alone the entire housing stock. This trend is repeated in older homes. 1,819 tests on SEAI’s database relate to homes built to 2005 building regulations. Once again there’s a huge BER split between this sample and the 34,721 untested homes, which respectively average 112 kWh/m2/yr (B2) and 159 kWh/m2/yr (C1). The remaining 518 tests on SEAI’s database relate to any houses built before 2005 Part L, and the split between tested and untested houses is even more pronounced. The tested houses average 171 kWh/m2/yr (C1), whereas the 270,000 untested houses average 281 kWh/m2/yr (D2) – a full 100 kWh/m2/yr difference, indicating that many of the former group may have been tested after extensive energy upgrade work. If this data is clearly unrepresentative, how do we go about finding representative samples of our building stock? Perhaps unsurprisingly, the available data in this regard is severely limited. The best available Irish data appears to come from two sources. In 2010 the fuel poverty charity Energy Action carried out airtightness tests on 18 homes from the Dublin area before and after energy upgrade work, including external insulation, under a pilot phase of SEAI’s Warmer Homes scheme. The sample wasn’t representative of the national stock in terms of age of construction, location, tenure of occupancy or the likes, but it indicates a clear trend. The six oldest houses – built between 1920 and 1940 – averaged a fairly impressive permeability (at 50 Pa) of 4.96m3/hr/m2. The remaining twelve were built between 1960 and 1980, and averaged 8.69 m3/hr/m2. 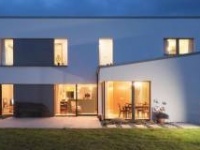 The 2005 Codema/DIT-led Energy Performance Survey of Irish Housing included airtightness tests on 28 out of a representative sample of 52 houses built after the introduction of 1997 building regulations. The sample is admittedly small, but there is a robustness both in the selection process to ensure the sample of 52 houses was representative in terms of location, house type, tenure of occupancy & construction method, and in how the report’s authors analysed the data, such as error bars to account for standard deviation. That said, the report doesn’t explain whether the subset of 28 houses is representative, nor does it apply error bars to the airtightness test results. The average air permeability result was 11.8m3/hr/m2 at 50 Pa.
Perhaps counterintuitively, the report found no clear correlation between a building’s airtightness and its heating consumption. This can at least in part be explained by the terms of reference of the study. No monitoring was done of indoor temperatures, meaning it’s not possible to tell whether people in leakier homes were suffering from lower thermal comfort. No account was taken for microclimate, and the effect of site specific (or local weather station) wind speeds on the level of infiltration each house typically experiences. And although one surveyor noted that wall vents were blocked in approximately 35% of homes, this data wasn’t a required part of the study, so its effect wasn’t quantified. In other words, the report doesn’t tell us how windy each location is, and it doesn’t tell us whether people in the leakier houses were putting up with colder temperatures, or were more likely to block up vents due to thermal discomfort. As for non domestic buildings, we’ve virtually no data to go on. Perhaps the best source is Brian Shannon of INAB accredited airtightness testers Building Envelope Technologies. "We've tested in and around 15 non domestic buildings over the list six or seven months, ranging from office blocks to warehouses," he says. The results have been shockingly bad - their q50 results have ranged from 13 m3/hr/m2 at best to 50.1 at worst. "A lot of them come in around 21 to 22," he says. "The average would be around 20 to 25."